Are You Looking at the Wrong End of the Donkey? If you have your finger on the pulse of Inside Sales, you know that breaking the ‘prospecting’ and ‘closing’ functions into two roles has crossed the chasm. Role specialization is here to stay. One of the big benefits is that specialized teams are responsible for a very clear piece of the sales process. You can measure effectiveness, add or subtract headcount, and course correct as needed. Sadly, it’s not all joy in Whoville. I’m noticing a concerning trend. More and more often, when revenue goals are missed, companies look at their Sales Development teams and assume that is where the problem lies. In some instances, it certainly is. But I’d hazard a guess that at least half the time, the problem lies further down the sales funnel – right at the feet of either the Sales Reps or, potentially, the sales process itself. I was recently working with an amazing client. They are one of my faves -- high growth, cool technology, great management team, solid sales and marketing infrastructure -- they have it going on! The problem: when they think about increasing revenue, they take a magnifying glass to their SDR team and rarely stop to inspect what is going on post lead handoff. 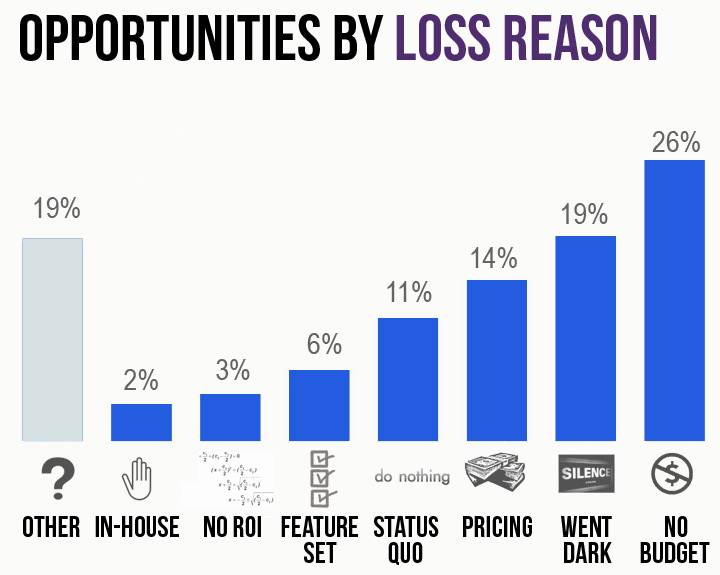 Working with one of the founders, we collected data on opportunities marked as “Closed: Lost.” Bear in mind, these were real opportunities (i.e. SDRs passed a lead that fit their Ideal Customer Profile and the Sales Rep conducted an initial call with the prospect). Looking at several hundred opportunities, here is what we found. At nearly 20% of losses, this is a significant. How many times are reps reaching out? Over what time period? What media? Are their messages giving compelling reasons for prospects to reach back out? Or are they ‘just checking-in’ and ‘touching base’? Are they asking the tough questions up-front? Or are polite prospects killing them with yes’s and then never emerging again? Net net: Drill into whether the sales is team going through the motions or asking the hard questions, early enough in the sales process, to truly qualify the opportunity. This is a tough objection to overcome, but it is a chronically overused loss reason. Are we DQing and losing early? Or wasting cycles working with prospects who don’t have access to untagged budget? How good a job are we doing at helping champions sell us internally? Net net: There is always untagged budget. You just have to find the person who has access and sell to them. This tends to be dumping ground for ‘I screwed up’ or ‘I don’t care enough to figure this out.’ Now might be the time to review the back-end of your sales process. Are reps leveraging a Manager to help them win the tough deals? Are they engaged with all the buyers in their funnel or are they only focusing on the ones they think they will win easily? Net net: As a Manager, knowing the answers to the above questions could make your number for you! When things go awry, we tend to focus on the top of the funnel. After all, that is where so much of the science of sales is focused. We do ourselves a disservice if we don’t take a hard look at the middle and bottom of funnel processes, too. 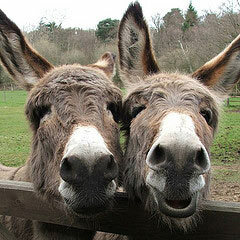 The donkey has two ends. We need to make sure we are looking at the right one.